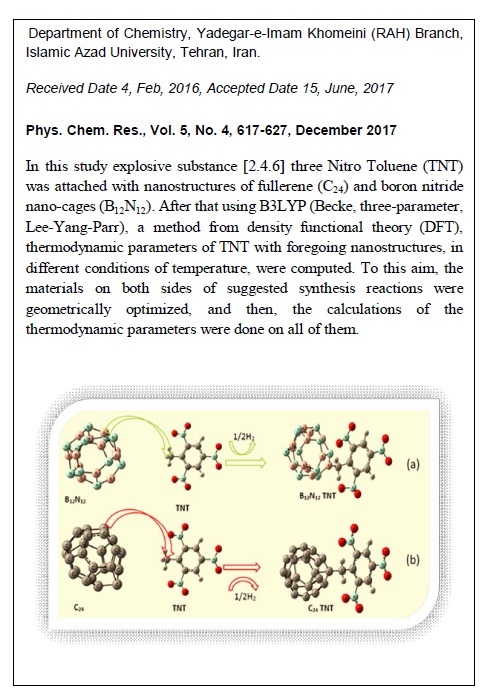 In this study explosive substance [2.4.6] three Nitro Toluene (TNT) was attached with nanostructures of fullerene (C24) and boron nitride nano-cages (B12N12). 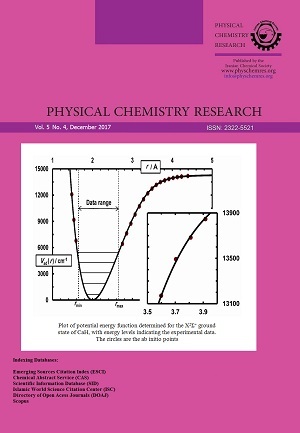 After that using B3LYP (Becke, three-parameter, Lee-Yang-Parr), a method from density functional theory (DFT), thermodynamic parameters of TNT with foregoing nanostructures, in different conditions of temperature, were computed. To this aim, the materials on both sides of suggested synthesis reactions were geometrically optimized, and then, the calculations of the thermodynamic parameters were done on all of them. The values of enthalpy(ΔH), Gibbs free energy(ΔG) and Specific heat capacity(Cv) for these reactions were computed, also various parameters such as energy levels, the amount of HOMO/LUMO values and related parameters including electrophilicity scale, chemical hardness, chemical potential, and the maximum amount of electronic charge transferred were computed, Finally, the effect of type and Molecular weight of nano structure fullerene ( C24, B12N12) on explosion properties and other chemical properties of TNT were evaluated.